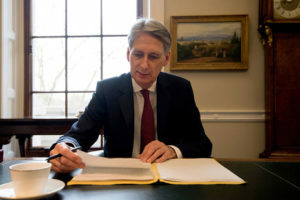 Chancellor Philip Hammond preparing his speech in Downing Street, London, ahead of the Budget on Wednesday. With the property market suffering from reduced levels of transactions, house prices static and a lack of confidence resulting in reduced funding options, there were high hopes that the chancellor would announce specific measures to revitalise the property market. Disappointingly those expected changes were not announced, and whilst Philip Hammond has announced a U-turn on increased national insurance contributions for the self-employed, we may need to await new property market initiatives. Absent from the budget was further help to homeownership in progressing incentives such as Help to Buy that directly drive transaction volumes at the lower end of the market. It is widely accepted that the higher end of the market is stifled, at least temporarily, by the punitive additional stamp duty levy of 3% that has served as a handbrake in the sector. This despite an expected drive from foreign investment as a result of the weaker pound that has not yet mitigated much of the volume depression. With varying levels of impact across the UK, the property development sector remains heavily restricted on liquidity, with high levels of stock in hand on the market coupled with the bank’s more cautious approach to lending in an uncertain market. The chancellor has not addressed any of these concerns amid looming uncertainty around Brexit and the Bank of England’s policy on interest rates in the medium term. As highlighted in previous Budgets, there is a continued focus to align the taxation system on employed individuals, director/shareholders and self-employed individuals. All three of which are utilised in differing structures with the property sector. The chancellor has also announced the implementation of a reduction in the tax-free dividend allowance from April 2019 to £2,000 from £5,000, directly impacting on those who remunerate themselves through a personal service company rather than directly as self-employed individuals. Furthermore, the chancellor plans to announce further changes to the personal service company and self-employed tax regime once a review is completed in the summer following the issue of a report by RSA chief executive, Matthew Taylor. Previous changes announced to the deduction against rental income of mortgage interest for higher rate and upper rate taxpayers will transitionally come into force from next month. Plans for the reduction in the rate of corporation tax remain unchanged, with the rate falling to 19% from April 2017 and ultimately to 17% from April 2020. With the new rating valuations applying from April 2017 some further help was announced for small businesses. In a three pronged tweak to the increasing rates, the chancellor committed to allowing businesses moving out of the small business rate relief to have their increases capped at £50 per month, while extending a £1,000 discount to 90% of UK pubs and a fund of £300m being set aside to be utilised as a discretionary subsidy by local authorities. If you have an interest in property and you wish to keep in touch with Watsons, then please contact our Head office on 01603 226550 and we can connect you to one of our property experts.